I have been following the work being done by The Brain Observatory at UCSD to carefully section the brain of patient H.M. The patient, whose identity was protected while he was living, is known as the most studied amnesiac. His amnesia was caused by brain surgery he underwent when he was 27 years old. I won’t redocument his history, it is widely available on various websites, a few of which I’ll list at the end of this posting. For me, this study is fascinating in terms of the completely open way the work is being done. 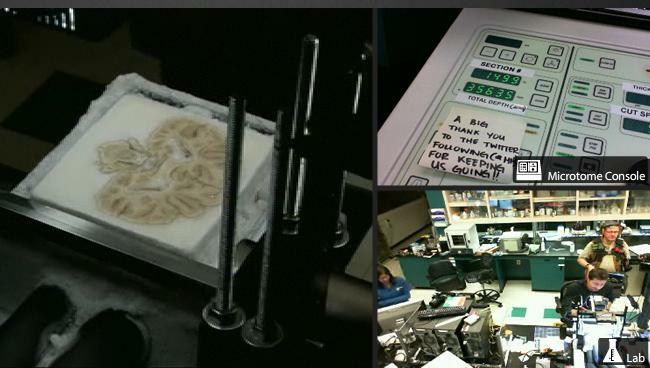 The process of sectioning the brain was broadcast in real time on UCSD’s website. The entire process that is being followed is being discussed in an open forum. The data being collected will be freely available. For me this shows the positive way that the web can be leveraged. I spend so much time in the world of commercial and proprietary software solutions that I sometimes end up with a distorted view of how the web is used. Most of my interactions on the web are in the creation of applications that are owned and controlled by companies whose content is only available to individuals with some sort of financial relationship with the web site owner. Clearly sites like Wikipedia make meaningful content available at no cost to the user. However, in the case of this work at UCSD, there is an enormous expense in terms of equipment and people in order to collect, store, refine and publish this data. This is truly a gift being offered to those with an interest in this field. I’m sure that other examples exist and perhaps a valuable service would be one that helps to organize such informational sites. You are currently browsing the archives for the Public Data category.